Taekwon-do is the scientific use of the body in the method of self defence. The aim is to condition the body so that it may gain the ultimate use of its facilities through physical and mental training. Translated from Korean, "TAE" literally means to jump, kick or smash with the foot, "KWON" means to punch or destroy with the hand or fist and "DO" means art, way or method. Therefore Taekwon-Do means foot-hand-way. Traditional:Learning how to use your body in a scientific yet artistic manner, to generate powerful techniques for both defence and offence. Sparring: This is the sporting aspect, which the majority of people associate with martial arts training. Self defence: The techniques learned in other areas of Taekwon-do can prepare you for self defence. You will learn how to make them as realistic as possible whilst also learning how the law looks upon self protection. General fitness: Every Taekwon-do lesson will involve exercises in general fitness. Philosophy-Theory: We ask that students understand the Taekwon-do as well as demonstrate it. Therefore you will learn some theory and philosophy behind the art. Undertaking physical exercise has many benefits. Naturally it is a way to improve fitness, flexibility and strength but Taekwon-do students also benefit from having specific goals to achieve in the form of a ranking grade system. Many people sign up to a gym membership, but never really use it. If you are one of those people, you should consider Taekwon-do. 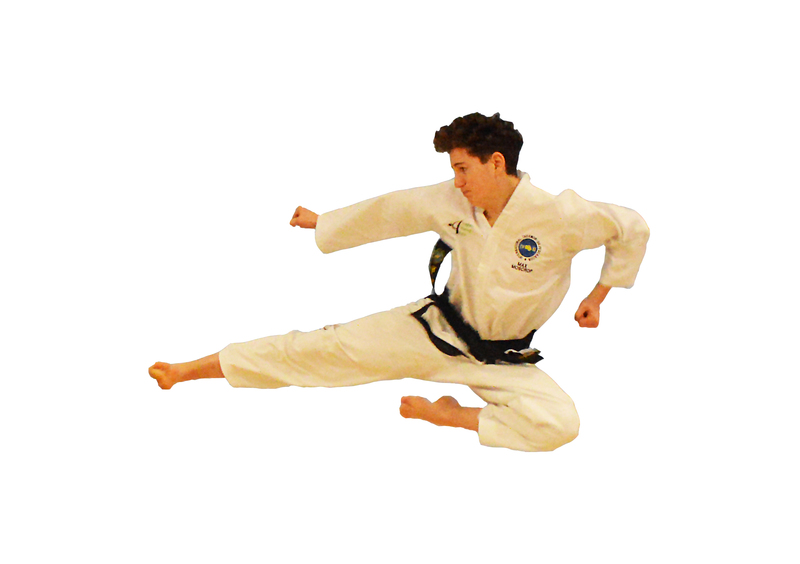 As a member of our Taekwon-do school you will receive one-on-one tuition as well as group training. Hence the instructor will motivate you as much as he can to the levels that are agreed upon. Only through expensive personal training can you get this from the average gym membership. Taekwon-do is also a great way to meet new people; with your new friends to motivate and work with you, everyone can benefit from the sense of mutual achievement and success. Combine this with the training in an art form from which you will gain assets such as improved confidence, self discipline and physical & mental focus, you are sure to excel in all aspects of your life. Taekwon-do is also a great way to spend quality time with your family, as you train, learn and develop together. Family memberships are extremely popular and our excellent rates offer great value for money. Gradings will be held regularly, typically every 3 months. To be considered for a grade promotion you must be attending classes regularly, have a great attitude and be improving in your Taekwon-do skills.